2019 promises to be another groundbreaking year for the waste, bioenergy and recycling sectors, with construction expected to start on 31 projects listed in AcuComm’s WasteView Projects database during the first quarter. These projects will involve a total investment of US$1.4 billion, will have a waste throughput of 4.1 million tonnes and will add 330 MW in energy capacity. 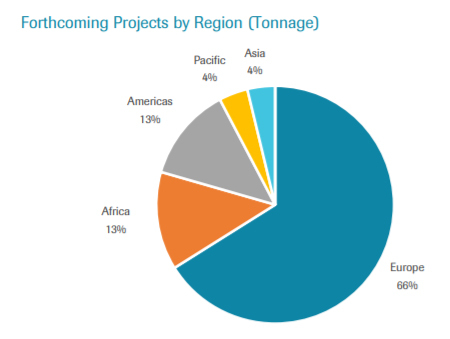 Activity will be led by Europe, with projects worth US$928 million due to commence in the first quarter, including 6 in the UK, 4 in France and 2 in both Denmark and the Netherlands. North America will see 5 largely small-scale projects start in the United States and 3 in Canada. The highest valued of these projects (as listed in our January 2019 WasteView Watch) is Biffa’s £250 million energy recovery facility at Newhurst Quarry near Shepshed in Leicestershire, UK. The development has been held up during the planning process over several years, but in November 2018 Biffa reported that the site permit application was progressing well. Construction is due to start in February on NGF Nature Energy’s new anaerobic digestion plant in Sønderborg in Denmark. This will involve a throughput of 600,000 tonnes per annum of mixed animal and agricultural waste, the largest feedstock capacity of any project due to start in Q1 2019. The plant will produce up to 21 million cubic metres of biogas for the gas network and local gas-operated buses each year. In terms of energy output, the largest project with construction work scheduled to begin at the start of 2019 is New Energy’s 18 MWe / 72 MWth waste-to-energy (WtE) gasification plant in Port Hedland, Western Australia. This A$200 million project will have an annual throughput of up to 130,000 tonnes of household, municipal and industrial waste. View the full WasteView Watch report.